Okay… back story! 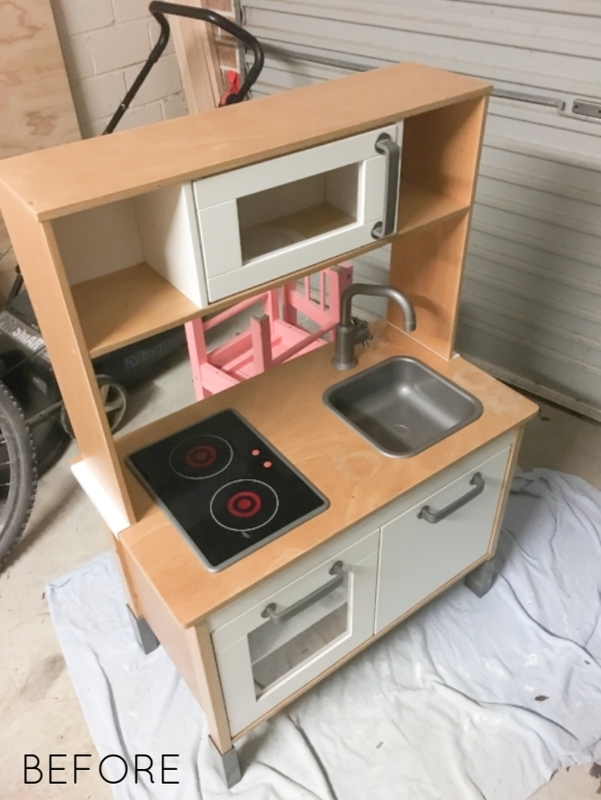 This post was meant to be published at the start of the year, but way back before that was when I originally snagged this 2nd hand IKEA Duktig kitchen off Gumtree for a steal! It was almost in too good a condition to hack up, but I did it and I’m ever so glad I did! I had been gawking at Duktig makeovers on Pinterest for months, getting ideas here and there but really had my very own little plan right from the beginning. I hacked this one way back in August/September last year (!! ), but intentionally held off sharing anything as it was kept hidden for her Christmas gift. Thankfully, I wrote up the whole tutorial while I was renovating so today I can share it all with you… better late than never, right?? 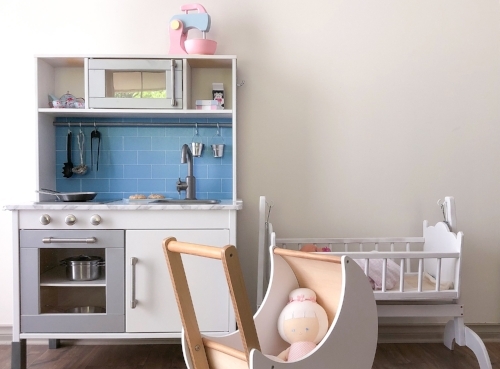 Call me crazy, but I wanted to create a mini version of our own kitchen, and thankfully we had just the right supplies left over from our renovations to do just that. I used the same spray paint as our cupboards and we had some handles left over, which amazingly fit the holes of the Duktig kitchen perfectly. The bench top was a little trickier and this is where we had to compromise, as it was either a beige vinyl tile (that looked like it was from the 1990’s) or a calacatta marble vinyl contact paper. After trying the tile and dying a little inside, the marble won out. plus somesandpaper, a straight edge, masking tape and lots of drop sheets! I started out by taking off all three doors, removing the sink and mixer tap, and completely removing the top section of the kitchen. I masked up the windows of the oven and microwave door so when they were sprayed the plastic would stay clear. Everywhere was given a light sand to remove any grime and then a good clean. Then I sprayed… and sprayed… and sprayed! Every where was given at least two coats of paint. First up was a white coat over the whole kitchen and the door that sits below the sink. The oven and microwave door were sprayed with silver to make them stand out as appliances. Next, it was time for the splash back. I used a 3mm piece of MDF board, sprayed with gloss blue and sanded back with 320 grit paper between coats – until I had a beautiful glossy finish. Then it was cut to size and using the white paint pen and a ruler, I drew on the subway tile pattern. Finially it was attached to the top part of the kitchen with some glue & nails. Once everything was dry the vinyl tiles were cut to size and stuck down…. I immediately started wishing I hadn’t used them. So it was off to the shops for my roll of marble adhesive which was stuck down in place of the tiles… The rounded corners were a little tricky as I wanted the marble to wrap around the bench top, but we got there in the end and it looks a million times better than the previous option! Finally I could put everything back together. Adding new handles to the doors, attaching the hook to the side and screwing on the knobs above the oven door were the final touches! 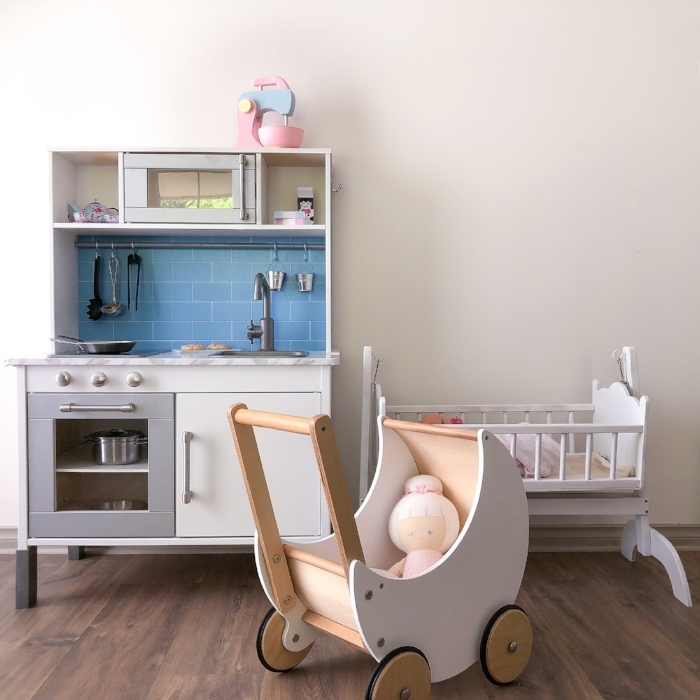 This little kitchen has been a huge hit with Summer, she’s currently going through a “copy mummy” stage and absolutely adores her mini version of our kitchen!